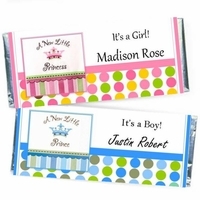 We offer affordable and inexpensive Candy Bar Wrappers, and Candy Bar Favors for all occasions! We even offer Candy Wrappers and Favors for Corporate Events, school events, and proms or any other occasion you can think of! 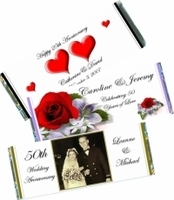 We have our own exclusive Candy Bar Wrapper designs that will turn an ordinary Chocolate Bar Cover into something truly special. 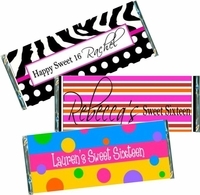 Personalized Candy Bars are a great way to thank your guests for sharing your special day, or event. Besides, everyone loves chocolate! 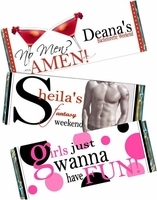 Your guests will love to receive one of our fabulous Candy Bar Wrappers! 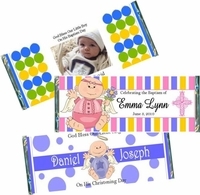 Candy Bar Favors are great for any occasion, Adult Birthdays, Baby Showers, Bridal Showers, Kids Birthdays, Bachelorette Parties, 1st Birthdays,Sweet 16, First Holy Communions, Christenings, Weddings, or any SWEET occasion. 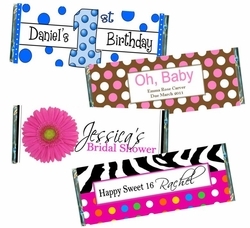 We have so many fun and trendy designs to choose from that we're sure you will find the perfect Chocolate Wrapper! 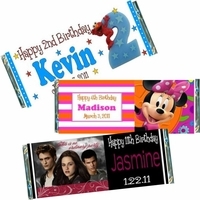 We can add a photo to your wrapper, or design a Custom Candy Bar Wrapper for you FREE! Have a special theme or color in mind? 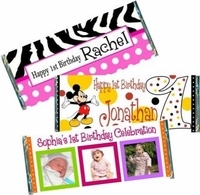 Our designers will work with you to create a one of a kind Custom Candy Wrapper for you free of charge. 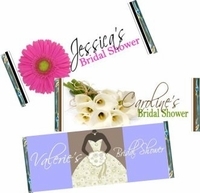 To sum it up, we will Personalize your Chocolate Wrapper FREE, we will Customize your Wrapper FREE, adding a photo to your wrapper is FREE, emailing proofs of your Wrappers are FREE! Plus if you order the Candy Wrappers only without the chocolate you even get the foil wraps FREE! You can't beat that! And with 2 ways to order, we have something for everyone. 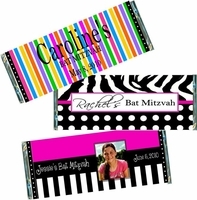 You can order the Candy Bar Wrappers only or, order the fully Wrapped Candy Bars and let us do all the work for you! 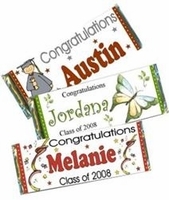 Your Candy Bar Wrappers are printed on a laser printer using high quality glossy paper, to make your Candy Bar Favors look fantastic! We treat your party or event as if it were our own. 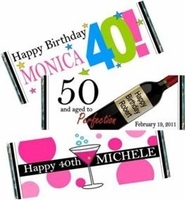 We have cool and amazing Party Favors, and excellent customer service! Ordering is quick and easy, and there is always someone here to help you! 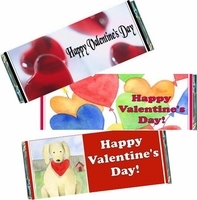 Order the DIY - "Do it yourself" CANDY BAR WRAPPERS and wrap your own candy bars. Our wrappers fit the Hershey®'s 1.55 oz., Kit Kat 1.5 oz. and Jumbo Hershey's® 4.4 oz candy bars. This is a great alternative for the do-it-yourselfer. You will also save on shipping costs, plus the cost of the Chocolate Bar! 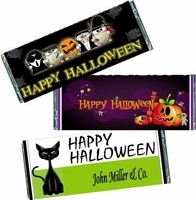 Our Candy Bar Wrappers come ready for you to assemble on your own Chocolate Bars. 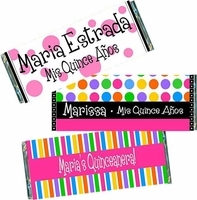 With every wrapper order, you will receive easy to follow instructions for wrapping your candy bar with foil, and your Personalized Candy Wrapper. We included the silver foil (FREE) to make your candy bars look like the classic Hershey®’s bar! Order the FULLY WRAPPED CANDY BARS Sit back, relax and let us do all the work for you. 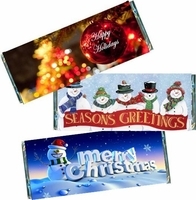 We will wrap your chocolate bars for you in the wrapper design of your choice. 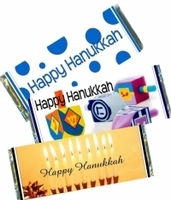 First we wrap your candy bars with silver foil sheets, then wrap your designer wrapper over the foil. 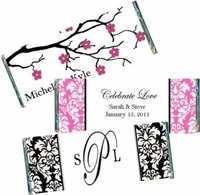 You will receive a complete Party Favor, all dressed up and ready to hand out to your guests!